It’s tough to know how to teach a child to tell time. Learning how to read a clock is a challenging concept to grasp and many kids struggle with it. Fortunately, there are plenty of resources to help. Looking back on it, I like to think I was at least average in the learning department when I was a kid. I loved to read, I was a decent speller, I struggled a bit with vocabulary (but I was a whizz in math), and I was great at “BS-ing” my way through essays in English class, but when it came to learning how to tell time, I really struggled. I can still hear my dad’s voice laughing when I would stare at my watch, count my little heart out, and then excitedly say, “it is 58 minutes after 4 o’clock!” when he asked me what the time was. And I remember spending hours playing this little computer game he bought to help me learn how to tell time. I eventually did learn how to tell time and have no issues in the time-telling department anymore – LOL – but I remember that learning how to read clocks was a tough concept to grasp. Since we no longer own that little computer game (or that antiquated computer) and my 5-year-old is very obviously ready and interested in learning to tell time, I’ve been on the hunt for toys, games and time-teaching activities to help my daughter. So far, Telly The Teaching Time Clock and the Melissa and Doug Turn and Tell Clock have been a HUGE hit with my little one. These hands-on teaching clocks really help her grasp the concept and give a nice visual example to learn with. Plus, they are easily manipulated and changed by little hands. The bonus is both these teaching clocks are really cute, too. We’ve also enjoyed the Ravensburger My First Clock Learning Game. This simple board-game has three different variations with moveable hands and double-sided cards. This helps with number recognition and helps kids connect digital with analog time-telling. A friend highly recommended the Eeboo Time Telling Game (she’s gifting us a set for Christmas). This is another fun time-telling board game for 2-4 players. This game helps kids build up their time telling skills by identifying and replicating the time printed on cards on their own manipulatable clock. The cheery clock faces are really adorable as well. All of these time-telling games and teaching clocks are great investments for a pre-school through second-grade level child, who’s learning to tell time. It’s fantastic there are so many excellent options and resources out there to buy. But, while I love games to purchase and play with my child, I also like DIY activities the two of us can do together. So, I did a little research to find the best time-telling learning activities. Here are 8 fabulous clock activities to help little ones with the concept of learning to tell time. These activities are great for pre-school to early-grade-school aged kids and offer lots of hands-on learning. Within no time, your little student will start reading the clock on the wall! 1. Grab some old plastic Easter egg containers and play this DIY telling time game I found on Mom to 2 Posh Lil Divas. This is such a cute game for teaching time and one that requires almost no supplies. Kids simply match up the top half of the egg (printed with a clock) to the bottom half (printed with the time). You draw the times on the eggs with a Sharpie and you’re good to go. It’s a great way to recycle those plastic eggs after the Easter bunny has moved on. 2. Make one of these analog clocks over on Teach Mama. She includes pointers on how to create the clock, as well as other ideas to help teach your kids to tell time! This is a great hands-on guide for kids to use as they work on their homework too. They move the hands on the printed clock and adjust it to match their worksheet as they go along. Being able to solve their homework themselves will build confidence. 3. Order one of these telling time busy bags I found on Etsy. The cute hands on this foam clock are changed and moved to match the cards in the learning game. Plus, the teaching clock is made of kid-friendly foam numbers that pop in and out. Kids will follow the activities on the cards and match the clock to the busy bag activities. 4. Check out this collection of online time-telling games I found on Technology Rocks. Seriously. These are all free time games for kids on the computer, tablet or even from your phone. For some kids, learning on a screen seems to forge the connection faster than learning on paper (for others, the opposite holds true). These fun clock games will help your child learn how to tell time in the way that suits her best. 5. Make this paper clock by Kiwi Crate to help simplify all the different rules on telling time. I love how easy this time-telling game is to make from home. All you need are a few paper plates—so cheap, yet totally effective. Kiwi Crate has lots of cute ideas for learning games and activities to help your child learn how to tell time, add, identify letters and more. Definitely check out their selection of learning resources. 6. Check out these clock games and activities I found over on Teach Kid Learn. These time-telling activities require very few supplies—many only need paper or items you already own, like a stopwatch. There are also practical, hands-on learning activities for kids who are struggling with the concept of telling time. 7. Make one of these paper plate sundials I found on Munchkins & Mayhem to get your kids excited about telling time. There’s something so cool about a sundial and learning how to tell time outdoors. Plus, it helps your child form the connection between daylight and the time on the clock. Telling-time is a totally new concept for kids if you think about it, and correlating the passage of time with the position of the sun helps kids really “get” time. 8. Download and setup this awesome scrambled schedule active time-telling practice activity from Deceptively Educational. This is a great example of how making a game out of telling time will help it click for kids. Writing the time on the cards also helps them associate what they see on digital clocks with the position of the hands on an analog clock. Kids nowadays may rely more on digital time-telling, but they’ll still need to understand the positions of the minute hand, the second hand and so on, so they can learn how to read an analog clock too. Hopefully, this gives you a few activities to teach your kids how to tell time. It’s a tough concept, but once it clicks, they’ll feel so proud of their ability tell you exactly what time it is. 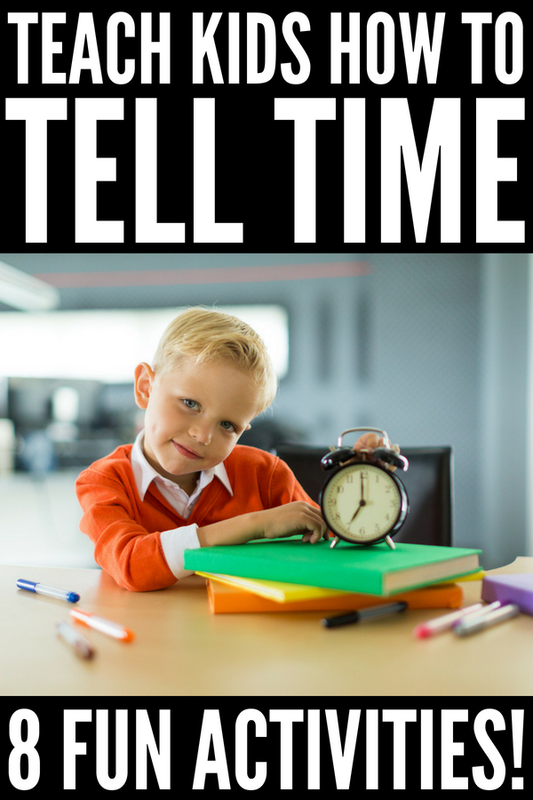 If you enjoyed these learning to tell time activities, please share them on Pinterest! And if you’re looking for more ways to have fun with your little one, please follow our Kids board on Pinterest, where we share all kinds of great ideas!